More details surrounding Emporio Armani's Connected Android Wear device have surfaced at Milan Fashion Week. The smartwatch, which was first unveiled back at Baselworld in February alongside a line of Armani Exchange Connected hybrids, is now confirmed to be available from 14 September. Initially, the Fossil-backed brand were tight-lipped on the details, though the company has now revealed the device and its hybrid siblings (below) will feature activity tracking that can connect with apps from Google Play to track steps, runs and fitness goals. Users will also be able to stream and control music from the watch, while Google Assistant is also in tow to help you to keep tabs on the likes of the weather, reminders and directions. If you want to mix up your straps, 11 options will come available in leather, silicone or stainless steel. In terms of form, it appears the Android Wear device (pictured above) will bear a fairly strong resemblance to the Emporio watches released late last year. The frame will feature an extended crown, though, plus two buttons on either side. We also know that the Emporio Armani touchscreen will be compatible with both Android and iOS, while featuring a Snapdragon Wear 2100 processor and running on Android Wear 2.0. Details about the all-new screen are still unclear, but Fossil insists the AMOLED is "high resolution". 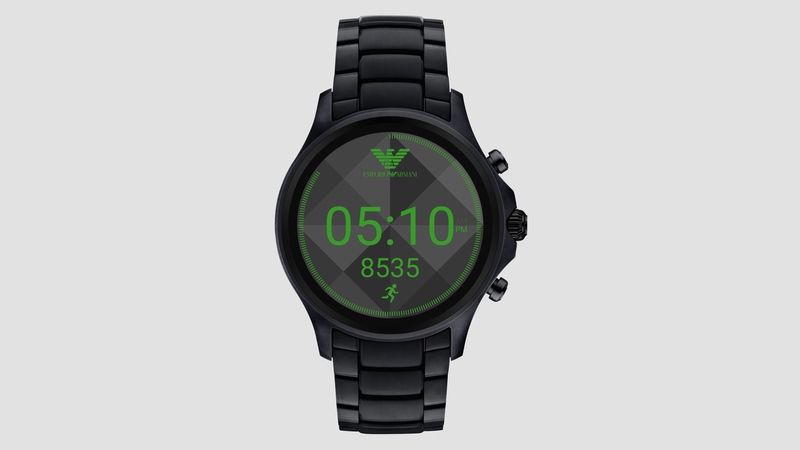 Like several of its Fossil relatives (the collection includes not only new Fossil-branded smartwatches but the Diesel On, the Michael Kors Access Sofie & Grayson and the re-imagined Misfit Vapor), the Emporio Armani Connected will also bring branded micro-apps to the table. In this case, the result will mean you can customise eight watch faces and colour combinations and use the Saved Faces app to, well, save the faces. For those looking to keep things more analogue-friendly, Emporio Armani Connected's new line of hybrids will also release alongside the Connected touchscreen model. The entire range will provide discreet notifications plus activity tracking and will feature a slimmer form, Fossil says. And from what we can see from the styles shown above, there at least appears to be a healthy variety of styles. As for pricing, the leather versions will be available for $345 and the bracelet versions will be available for $395. There's no word on UK pricing yet, but that could come as we close in on launch later this year.